Anyone paying attention to the outdoors can't help but notice the Maryland landscape is showing signs of changing. The vibrant green of trees is rather dull, and in some areas the leaves are turning brown and falling to the ground. The color change and the falling leaves during this time of year are caused by the general lack of rain. There is no question many areas could use some rain to replenish streams, rivers, lakes and ponds. On the brighter side, despite a recent return of hot weather, the evenings are a bit cooler and profound changes in our freshwater and saltwater fisheries are not far away with cooler weather approaching. Water temperatures in the upper bay near the mouth of the Susquehanna River have remained above 80° this week due to hot weather and the lack of water releases from the Conowingo Dam. There has been some early morning topwater action in the area but most of the better fishing for striped bass is occurring farther south starting in the area around Pooles Island and extending to the Bay Bridge. There has been good striped bass fishing by a variety of methods. Breaking fish are being encountered from the Rock Hall area south to the Bay Bridge and casting or jigging has offered a lot of fun light tackle action. A large portion of the breaking fish are composed of sub-legal striped bass and bluefish but there are larger striped bass mixed in. Trolling small spoons such as Drone spoons behind planers has also been very effective along channel edges. Live lining spot has been by far the most popular method of catching a nice grade of striped bass. The most productive areas have been the channel edge from Sandy Point Light north to the 30' channel edge below Belvidere Shoal. There has also been good action over near Love Point on the 30' channel edge there and the deeper Bay Bridge piers. Nick Long got to go fishing with his dad recently and gets a little help from dad while posing with this beautiful 35" striped bass that Nick caught above the Bay Bridge. Striped bass fishing in the major tidal rivers of the upper bay has been relatively slow recently, mostly lightly due to elevated water temperatures. It may take a 10° drop in water temperatures or more to revitalize this shallow water fishery near shoreline structure. White perch have been filling in the void for light tackle fishing and they are being found near piers and rocks. In the middle bay region a mix of striped bass of various sizes, small bluefish and Spanish mackerel can be found busting through schools of bay anchovies and small menhaden throughout the region. Some of the more active areas are the western side of the bay from Hackett's Bar south to the Power Plant, Eastern Bay, the Buoy 83 area, the False Channel and the mouth of the Little Choptank. Diving birds often mark the way but slicks are not to be ignored since they are telltale signs of recent feeding activity or present activity down deep. Casting various types of metal and jigging are a fun way to enjoy some light tackle action. Trolling Drone spoons, bucktails and surge tube lures (hoses) behind planers is a great way to get into the mix of striped bass, bluefish and Spanish mackerel. 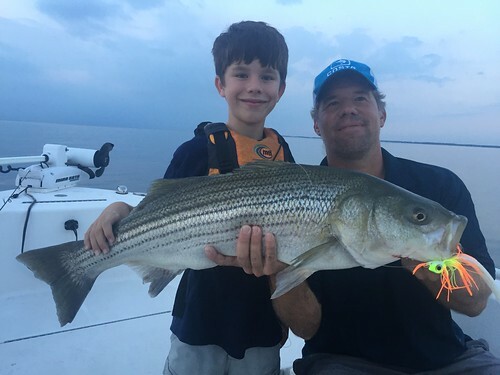 Live lining along the 30' channel edges on both sides of the bay has been the most popular method of fishing when a larger grade of striped bass are on the agenda. Pesky bluefish do tend to take a toll on spot now and then but placing a chunk of fresh spot on a hook and drifting back can wreak some revenge and also provide some tasty eating whether smoked or grilled. Much like other regions in the bay the shallow water topwater fishing for striped bass along shorelines in the bay and tidal rivers has not really kicked into gear yet. Water temperatures are close to 80° and it is just too hot to entice larger striped bass to venture into shallower waters to feed. There is some white perch fishing to be found in these areas but unfortunately most of the white perch are less than 10". Due to the lack of rain the salinities in the bay are relatively high and those that are bottom fishing are seeing all kinds of summer visitors that are not so common other times of the year. Northern puffers, burrfish, northern and southern kingfish, small sea bass, cobia, small tautog and small red drum along with their parents that often exceed 40 lbs. or more. It can be challenging at times to identify fish that you are not used to seeing in the Bay. One fish that can easily fool you are juvenile black drum, which a look like the sheepshead. 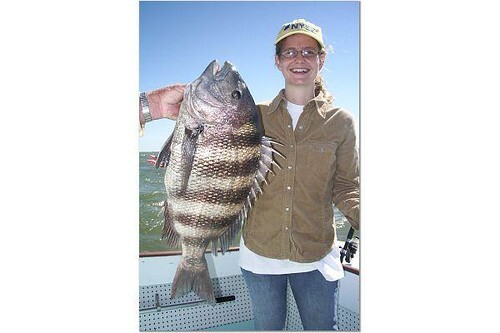 When black drum are small they exhibit strikingly bold vertical stripes that can cause some confusion with a sheepshead. Black drum do not have the bold enameled teeth that sheepshead have and they also have barbels under their chin which sheepshead do not. 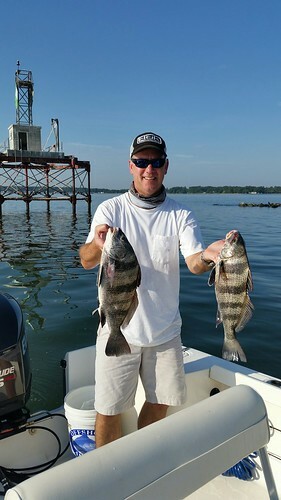 Bottom fishing for a nice grade of white perch has been good in the deeper waters of the bay and tidal rivers over good oyster bottom this week. Most are using bottom rigs baited with bloodworms when targeting white perch and spot. Peeler crab can work at times and is usually the preferred bait when croaker fishing. Croaker fishing remains fair in the middle bay region and is mostly an evening affair near channel edges leading to shoal areas. The lower bay is providing a wide variety of fishing opportunities this week ranging from excellent bottom fishing to exciting breaking fish. A mix of striped bass, Spanish mackerel and bluefish are being found chasing bait throughout the region and at times large red drum can be part of the mix. Most of the action is taking place out in the bay from the mouth of the Potomac up along the western side of the shipping channel and from the Middle Grounds north past the Target Ship up to Hooper's Island on the eastern side of the bay. Light tackle casting and jigging to breaking or suspended fish has been popular. Trolling Drone spoons behind planers along with surge tube lures and bucktails has also been a very effective way to get in on the action. There has also been some limited live lining prospects off of Cedar and Cove Points. Large red drum and cobia are still being found in the vicinity of the Target Ship and below Smith Point. Bottom fishing for large spot has been very good in the lower Patuxent River and Tangier Sound. White perch fishing in the tidal rivers has been good and croakers can be found in about 25' of water in the evenings near channel edges. Fishing for medium-sized blue catfish has been excellent in the lower Potomac River from the mouth of the Wicomico River up past the Route 301 Bridge. Recreational crabbing continues relatively good to excellent this week. The upper bay is providing fair to good crabbing depending on which tidal river one crabs in. The Magothy and Chester have been good but others are reporting mixed results. In the middle and lower bay regions crabbing has been good to excellent with the largest crabs coming from deeper waters. The recent massive shed of a week to two weeks ago has caused a lot of light crabs to be a major component of the fishery this week, as are sooks. Check crabs carefully and toss those light ones back since it will only take a week or so for them to fill out. Most have noticed that despite the return of relatively hot weather, the nights are a little cooler, which is signaling a slow shift towards fall. Flows in many of the streams and rivers throughout Maryland are low due to the lack of rainfall and lakes and ponds are lazily holding on to what is left of summer. The upper Potomac River is running very low this week causing grass to appear thicker and water clarity to be very clear. It pays to downsize lines, think about fluorocarbon and make casts towards likely looking structure from farther than normal distances. Smallmouth bass tend to be spooky under low and clear water conditions. There has been good fishing in the grass and deeper submerged ledges and boulders with stick worms and tubes. In the early mornings and late evenings topwater lures can work well over grass for smallmouth bass also. In the tidal Potomac River water temperatures are close to 78° and grass has been the main target for largemouth bass fishermen using topwater lures and stick worms. As tides recede working the edges of grass with spinnerbaits or small crankbaits can be a good option. The tidal rivers of the Eastern Shore offer plenty of elbow room for largemouth bass fishing with good water quality and beautiful surroundings. A mix of largemouth bass, chain pickerel and northern snakeheads can be found near grass or spatterdock beds and sunken wood. Topwater lures such as frogs work well over grass and spatterdock for largemouth bass and northern snakeheads at higher tides in the mornings and evenings. During brighter hours of the day targeting sunken wood and the shade of overhanging brush or docks is a good bet with a variety of soft plastics. 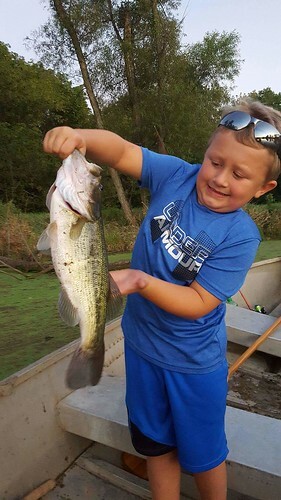 Gabriel Kiebler got to go fishing with his mom and dad after school and holds up a nice largemouth bass he caught. Large reservoirs and lakes continue to offer good fishing for a variety of fish. Many of the WSSC reservoirs hold a wide variety of fish ranging from landlocked striped bass and white perch to smallmouth bass and the ever popular largemouth bass. All are in a summer mode of activity so one needs to fish accordingly. Crews are busy at the state's trout hatcheries preparing for the October trout stocking of many of Maryland's trout management waters. The stockings are scheduled to begin in October and they will be posted as they occur on the trout stocking website and to Fisheries email subscribers. There is no advanced stocking notice as is traditional with the spring stocking of trout. The link below will take you to the trout stocking website and there is also a link there to become an email subscriber. As the Ocean City area winds down its traditional summer tourist season fishing is kicking into high gear. Surf fishermen are enjoying a nice mix of small bluefish, kingfish, croaker, spot and flounder in the surf. At the inlet flounder are being caught along with sheepshead and triggerfish near the jetties during the day. Spot are becoming more available and drifting live spot is accounting for some very large flounder, weakfish and striped bass. In the back bay areas, flounder fishing has greatly improved with better water clarity in the channels. Outside the inlet flounder are being caught on the nearshore shoal areas and farther offshore at the wreck and reef sites. Farther out the offshore fishing fleet is finding the best white marlin fishing of the season. Double digit releases per trip are not uncommon with blue marlin and sailfish also being part of the action. Dolphin, wahoo and yellowfin tuna are rounding out the offshore mix. The Poorman's, Washington and Norfolk Canyons along with the Rock Pile have been the most popular fishing destinations.